Ehhh... it was okay I guess. 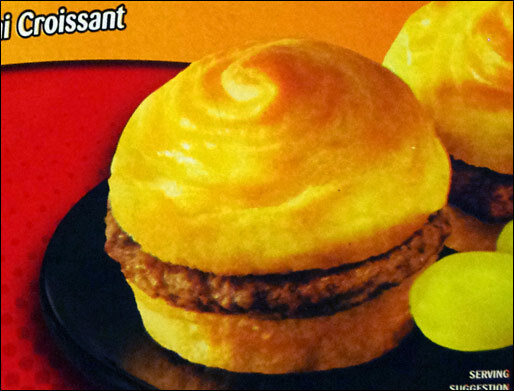 The product is little turkey sausage patties sandwiched between mini croissants. Each Breakfast Mini is two-inches in diameter. The turkey sausage is okay on its own. It's nicely seasoned and you if you don't tell someone it's turkey they probably won't question it. The texture is a tiny bit spongy, which is sometimes the case with microwave sausage patties. The croissant is fine. It's not a bakery croissant. It's not flaky and it's not buttery, but it does manage to a bring croissant flavor to mind. It reminded me of a croissant crossed with Wonder bread. The sad truth is that this product is kind of boring. It's okay sausage between a near-croissant. A serving consists of two Breakfast Minis. It satisfied my belly, but the breakfast-craving part of my brain scoffed, "Why are you giving me appetizers?" For a late night snack, I made these again... only this time, I placed a quarter of a slice of Cheddar cheese in each sandwich. That made them a little more interesting. The microwave time is 60 seconds. I did 40 seconds, added the cheese and microwaved for 20 more seconds. There's nothing wrong with this product. It is what it is... kinda dull. To its credit, the actual cooked product looks exactly like it does on the box. Nutritional Considerations: A serving of 2 Breakfast Minis has 230 calories, 10 grams total fat (4 grams saturated and 0 trans), 30mg cholesterol, 440mg sodium, 25 grams total carbs, 1 gram dietary fiber, 4 grams sugar and 11 grams protein. 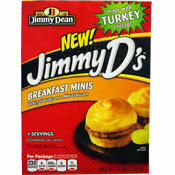 What do you think of Jimmy D's Breakfast Minis? Ha. I too was thinking of Wonderbread when I tried to think what the croissant tasted like. 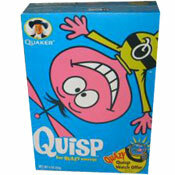 These make good snacks, but are kind of weak for breakfast. Their sausages between pancakes are better... called Griddlers or something that sounds like that.